One of the three students who had headed the reorganization of the Alpha Epsilon Pi fraternity has resigned because of the national's process for reorganizing the chapter. In a letter, Steven H. Baden '92 said that the reorganized fraternity "was an insult to the expelled brothers, the MIT Greek system, and the MIT community at large." Baden said the reorganized chapter only had "four or five" members left and that by today "this whole episode will be little more than an unpleasant memory." 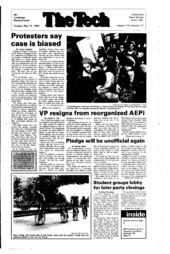 But the chapter's president, David S. Borison '91, said the new AEPi chapter was moving forward. "We will be a good fraternity." Borison would not reveal how many members the chapter had, but said, "We lost Steve, that's about it." Earlier, the chapter claimed to have about 15 interested students. The national fraternity expelled 45 of the 55 members from the MIT chapter earlier this year. The national said the reorganization was prompted by violations of the Fraternity Insurance Purchasing Group rules, but members of the new and old chapter said poor relations with the national were at the root of the expulsions. Baden, who had been elected vice president of the chapter less than two weeks ago, said he reconsidered his membership in light of "other views" about the national's actions. He concluded that the national had treated the MIT chapter poorly and not gone through "proper channels" when initiating the reorganization. Baden said he did not want to be associated with "an organization whose behavior I found reprehensible." Borison claimed Baden's letter did not reflect Baden's current views. "[Baden] believes what the national did is correct and is gung-ho for the chapter," Borison claimed. But "he feels right now it is creating strife among the Jewish community." Baden refused to comment or disassociate himself from the remarks in his letter. Members of the new AEPi chapter and the national organization met with Hillel representatives last night to try to improve relations. According to several students, the meeting was often heated. The non-AEPi Hillel members told the fraternity that it could only help the Jewish community by leaving campus. The national stressed that they had no intention of leaving campus. Borison said the names of current members would not be revealed because they "don't want to deal with this hassle." He stressed that "they want to be in this fraternity" and said the chapter should be judged on its accomplishments in the coming years.